The energy business is – and always will be – incredibly profitable. Indeed, if you explore for, produce, or deliver energy – no matter what kind – you have an ever-growing customer base with ever-growing demand for your product or service. But you'll make even more money if you can find a way to make energy's biggest players more efficient, more productive, or more profitable themselves. You see, new technology, regardless of the industry, is where the real money is made. Look no further than Google Inc. (NasdaqGS:GOOG) or Microsoft Corp. (NasdaqGS:MSFT). These companies developed blazing new technologies that improved daily life and day-to-day business for everyone around them… and soon exploded with profits. If you got in on the ground floor, your gains were astronomical. Google is up 600% from where it IPOed in 2004, while early buy-and-hold owners of Microsoft have raked in 32,400%. Or look at global security and IT company Lockheed Martin Corp. (NYSE:LMT). It pursues tech advancements for the defense and aerospace sectors – with results that empower its customers and provide huge upside for investors… to the tune of 16,227% gains. The energy sector is no different: Companies that know how to boost the big boys' bottom lines are destined to fuel the world for centuries and make investors rich in the process. In fact, you could triple or quadruple your money within eight to 12 months... on the way to potentially millions in the next decade… with the five energy technology breakthroughs below. That's because these savvy niche companies are not only improving the industry and making energy more affordable and more efficient. They're creating entirely new businesses within the energy industry. Solar has always been a fascinating but highly uncertain market for the average investor. There are breakthroughs, but these are largely startups with insufficient working capital, prone to huge gyrations. One exception has emerged in a sector that is absolutely crucial: connecting the new technology to the existing grid. And one company just happens to have the solution – and the positioning – to pull this off. It's a breakthrough technology that's simply one of the most significant energy advances to come along in some time. This company has some 118 million shares outstanding, but a market cap of just $450 million. Trading at about $4.00 does not leave much margin for error. Satcon Technology Corp. (NasdaqCM:SATC) is a leading provider of utility-grade power conversion solutions for the renewable energy market. The Boston-based company, with locations in North America, Europe, and China, is capturing an essential position in the interconnection between solar generation and the distribution grid. Satcon's been in this sector for the past 25 years. But thanks to its improving technology, others are now taking notice. Introduced in 2009, the SATC Solstice leverages string level power conversion and energy harvest optimization that is integrated as a complete system with a highly optimized centralized inverter. A solar inverter does essentially the opposite of what a converter does. It changes DC (direct current) voltage from batteries or solar panels into the standard AC (alternating current) voltage that most common tools and household appliances use. According to the company, this system increases the overall energy yield of solar installations by 5% to 12%, while simultaneously reducing the other balance of system material costs by 20% to 25% (compared to the only other centralized inverter systems available). A highly optimized utility-scale power plant with higher reliability and higher power production levels… all of which can be viewed and controlled by the utility, just as they manage all other power plant assets on their grid network. This is a flat-out breakthrough in putting solar energy squarely into the power-generation mix. Satcon's inverters provide a critical bridge between the power source and the grid. These devices are reducing the cost of power production (always an issue with renewable sources), while at the same time increasing the efficiency of operations. It not only overcomes the problems with harvesting and distribution of solar energy… it seamlessly plugs solar energy right into the electricity grid. For the first time ever, the big boys can put their solar energy on the power grid. The technology is in wide and expanding use worldwide for one simple reason: It reduces loss of power (and therefore increases efficiency and reduces cost) at every step in the process. That allows larger solar complexes to suddenly become extremely profitable. And since this company has developed its technology to be used with a variety of different brands of equipment all up and down the system, it provides very welcome flexibility. Upgrades, system revisions, and repairs are easy and practically seamless. On October 13, Satcon announced that a combination of six Solstice units and six of the company's PowerGate Plus solar PV inverters would be used in a 1.2 MW solar power station at a water treatment facility in Kent County, Delaware. The PowerGate system is already the world's most widely deployed large-scale, utility-ready solution, with more than 800 MW in operation globally since its introduction in 2002. The Delaware plant, being built by the private Sustainable Energy Generation Group and funded by the American Recovery and Reinvestment Act, will be the first example of both Satcon systems used in tandem. The result is a seamless and fully-integrated system – from energy generation to grid application. According to Sustainable Energy, the clean energy provided by the plant will avoid releasing some 4,000 lbs of nitrogen oxides and sulfur dioxide, as well as 1.4 million lbs of carbon dioxide, that would have resulted from a similar-sized fossil fuel plant. Lest there be any doubt that Satcon leads the field, it also announced last fall the launch of its next-generation power conversion solution: Equinox. The Equinox 500-kW solution is built on the foundation of PowerGate and improves system-wide energy harvest and solar plant yield, enabling large-scale solar facilities to have the lowest Levelized Cost of Energy (LCOE). It features peak efficiency of 98.5% – the best in its class. Satcon is clearly on the move. But the big moves have yet to come. The company's Solstice system was selected for the 63-MW CIRO One Solar PV Plant now under construction in Puerto Rico. Around 126 Satcon 500 kW inverters will generate 116 million kW of energy annually. That is equivalent to saving 201,000 barrels of crude oil each year – and that's becoming quite an important consideration on the tiny island nation. In February 2011, Satcon was chosen to supply solar power inverters for a massive new utility-grade solar installation in Germany – at 19.5 MW, one of the country's largest – marking a major step in the company's growth in the European market. The solar sector as a whole has been taking a pounding this year, and SATC will experience downward pressure as a result, mirroring what we see in the sector as a whole. Much of this is a result of some overblown concerns about European-based solar energy orders. We will continue to see some volatility moving forward, but the sector is beginning to stabilize. SATC will rise ahead of the advance as a whole. Action to Take: Buy Satcon Technology Corp. (NasdaqCM:SATC) at market. And use a 30% trailing stop to protect your principal and your profits. If you fly as much as I do, you've felt the pinch of ticket-price hikes due to rising fuel prices. And without a major change in how we source jet fuel, this problem will only get worse… especially with ridership slowly returning as the recovery takes hold. Jet fuel is already imported in greater volume, and the refineries that can reliably provide it are limited. That's because refining puts jet fuel (which is really high-level kerosene) among the so-called "middle distillates" – along with diesel and low-sulfur heating oil. But prioritizing the need for high-octane gasoline ("light distillates") has taken up more of the available refinery capacity. They're producing less diesel and jet fuel than the market requires, pushing up the price. The aviation industry is demonstrating a desire – and readiness – for biojet fuel. The certification of biofuels on regular commercial flights is expected in 2012. The U.S.Air Force is aiming to use 50% domestic jet fuel by 2016 and began testing biofuel in its aircraft in March 2010. The European Union mandated that biofuels make up 10% of transportation fuels 2020. KLM Royal Dutch (OTC:KLMR), Japan Airlines (OTC:JALSF), Air New Zealand (OTC:ANZFF), and Continental Airlines (NYSE:CAL) have all reported successful biofuel flights. That's where our friend the camelina weed comes in. It's an oily flax that needs little nitrogen and water to grow – and it may just be the first big winner in renewable biofuels. In fact, last year, 14 airlines from four countries signed memoranda with Seattle-based AltAir Fuels for jet fuel derived from camelina oil. Those airlines include many of the big boys – Air Canada (TSX:AC.A), American Airlines (through AMR Corp. (NYSE:AMR), Delta Air Lines (NYSE:DAL), U.S. Airways (Nasdaq:LCC), JetBlue Airways (NasdaqGS:JBLU)… even FedEx Corp. (NYSE:FDX) and United Parcel Service (NYSE:UPS) are warming to "weed power." In spring 2011, Lufthansa (OTC:DLAKY) – another one of AltAir's buyers – will become the first airline to operate biofueled commercial flights, using an Airbus A321 flying between Hamburg and Frankfurt. First, AltAir will produce its jet biofuel at a new refinery in Antacortes, Washington, scheduled to start pumping by the end of 2012. It will blend with conventional production from the refinery to yield what is called a "hydrotreated" renewable jet fuel. And the refinery is operated by Tesoro Corp. (NYSE:TSO) – the initial investment move in advance of full biofuel production. Second, the refinery technology and processes AltAir uses come from UOP Inc., a subsidiary of Honeywell International Inc. (NYSE:HON). Third, AltAir has teamed up with Sustainable Oils to source the camelina it needs. 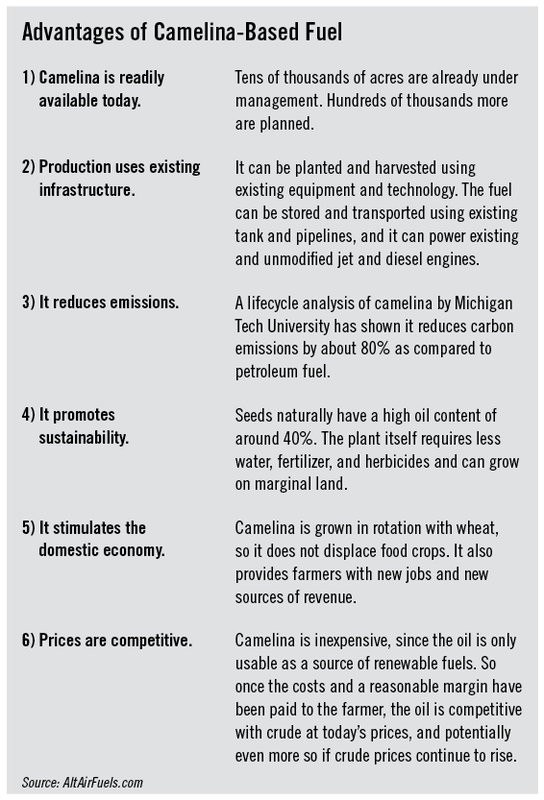 Sustainable Oils is the largest camelina research and production network in North America. It has contracts with hundreds of farmers and cooperatives throughout the U.S. One of its two partners is Green Earth Fuels (GEF). GEF, in turn, includes Goldman Sachs among its majority owners, as well as heavy-hitting international mover The Carlyle Group. The other partner, Targeted Growth (TGI), has as owners some of the leading investment funds in alternative energy – Alliance Bernstein, Capricorn Investment Group, GrowthWorks, the Skoll Foundation, and Victoria Park Capital. In this rapidly developing jet biofuel market, the initial providers will quickly increase production. AltAir already benefits from an alliance with well-capitalized companies and investment funds. As this market expands, Sustainable Oils, GEF, and TGI will join AltAir in going public. Rentech Inc. (AMEX:RTK) is already on the map with synthetic jet fuel production from coal. At least 250 million gallons of fuel is expected a year from its proposed plant in Adams County, Mississippi. AirTran Holdings Inc. (NYSE:AAI) has inked a contract for that production, while Denbury Resources Inc. (NYSE:DNR) will build a pipeline for the captured carbon dioxide and use it to enhance production at otherwise unrecoverable oil reserves. That's a nice value-added byproduct with some welcome positive environmental impact. Rentech has now begun construction on an energy production facility in Rialto, California, to produce renewable fuels and electricity from green wasteIt already has a multi-airline contract in place to supply eight airlines at Los Angeles International Airport with up to 1.5 million gallons per year of its RenDiesel® renewable fuel at beginning in late 2012 (when the plant is scheduled to go into service). On February 6, California-based BioJet Corp. announced it has received a $1.2 billion funding facility from Cayman-based Equity Partners Fund for its supply chain projects, including feedstock and refining projects. And Cincinnati-based Great Plains Oil & Exploration has now teamed up with Accelergy Corp. to blend Camelina oil and domestic coal to create clean biojet fuel using coal-biomass-to-liquid technology. BioJet has experience in developing fuel from jatropha, a plant Goldman Sachs has labeled a prime candidate for biofuel development. And Great Plains has been a pioneer in camelina oil production. Both companies are privately held, but are also likely candidates for a share offering. There's no doubt about it. This market will be a dynamic one. So keep an eye on your inbox... I'll send you an official buy recommendation as soon as it's time to pull the trigger in this sector. The Obama Administration has decided to emphasize nuclear power as one alternative to dependence on foreign oil. In 2010, it announced more than $8 billion in loan guarantees for the first nuclear power plant in the U.S. in almost 30 years. The President also proposed tripling the loan guarantees given to nuclear reactors to speed up nuclear energy generation. Given this newfound nuclear support – and concerns over the environmental impact of coal and oil – we are once again talking about reactors as a legitimate alternative source. Yet the problem with nuclear power has always been the inordinate delay and expense of bringing a new conventional nuclear reactor online. Ten years and billions of dollars… if you're lucky. The decade-long delay in getting a traditional new reactor online, along with the exorbitant cost, would seem to make any prospects for more immediate help in meeting rising energy demand remote at best. Galena has barely 700 residents. It sits on the Yukon River. For energy, it relies on diesel shipped up when ice-free passage allows – both an expensive and uncertain way to generate power. Therefore, the local council has decided to move in a different direction, one that will cut the settlement's electricity prices from 28 cents a kilowatt-hour to less than 10 cents in a matter of months. The settlement has accepted an offer from Toshiba Corp. (OTC:TOSBF) to install one of the company's new 4S ("Super Safe, Small and Simple") mini nuclear reactors. The Galena council approved the move in 2010, and the plant could begin operations by 2012. The 4S is a sodium-cooled fast spectrum reactor – that is, a lowpressure, self-cooling power plant – that will provide 10 megawatts (MW) of electricity annually for three decades before it needs refueling. The 4S is actually referred to as a "nuclear battery" because it has no moving parts. Upon completion, it looks much like a water tower. Once installed, it does not need to be maintained or even opened during its 30- year operating life. The real key to increase short-term impact is to decrease unit size. Recently, Daewoo Engineering & Construction Co. Ltd. (047040:Korea Stock Exchange [Koscom]), Hyundai Engineering & Construction (000720:Koscom), and Korea Electric Power Corp. (NYSE:KEP) have surprised many by wrestling Middle Eastern reactor contracts from better-known global leaders, such as the French-Japanese AREVA (OTC:ARVCY), Siemens (NYSE:SI), and Mitsubishi Corp. (OTC:MSBHY). It's the Toshiba 4S going into Galena – a result of engineering work at both the Japanese major and a U.S.-based Westinghouse subsidiary recently acquired by Toshiba. The 4S is already before the Nuclear Regulatory Commission (NRC) for licensing. Of course, the advances coming from Toshiba – other competitors certain to enter this market – have direct applications here at home. We are witnessing the miniaturization familiar to computer users. If we could liken a conventional nuclear plant to a mainframe, the minis seem the nuclear industry's version of a laptop: Almost anyone can afford one, and you can take it anywhere. Action to Take: Buy Toshiba Corp. (OTC:TOSBF) at market and use a 30% trailing stop to protect your principal and your profits. Last spring, I dodged a bullet. I was supposed to fly from D.C. to Brussels, and then on to Uganda to provide oil legislation advice to the government there on behalf of the U.S. State Department. However, a temperamental Icelandic volcano blew the top off a glacier, sent clouds of ash aloft, shut down Europe, and canceled my flights. Flying out a day earlier – as had been the original plan – would have put me among a million travelers stranded in airports, train stations, and boat piers across northern Europe. This single instance of geological theatrics from Mother Nature closed a continent in 24 hours. It was quite a display of natural prowess. Beginning in 1821, the same volcano spewed this stuff for years and, even earlier still, may have been largely responsible for the last great ice age. Which prompted some thinking as I spent hours unsuccessfully seeking another route to central Africa. Geothermal has been a steadily increasing source of energy for years. More than 20 countries use it to generate electricity and heat. While Iceland is the best known, with almost 20% of its electricity from the Earth's heat, the Philippines obtains over 16% of its power that way. Germany and Italy also generate significant power from the same source. However, it is in the U.S. – home to geysers like Old Faithful – that most geothermal energy exists. Chevron Corp. (NYSE:CVX), headquartered in San Ramon, California, is actually the largest producer of such power worldwide. And production is increasing. At last count, there are 77 plants with 3,086 MW of installed geothermal capacity in the U.S. According to the Geothermal Energy Association 152 new projects are in development in the U.S. – with California, Nevada, Utah, Hawaii, and Oregon leading the way. 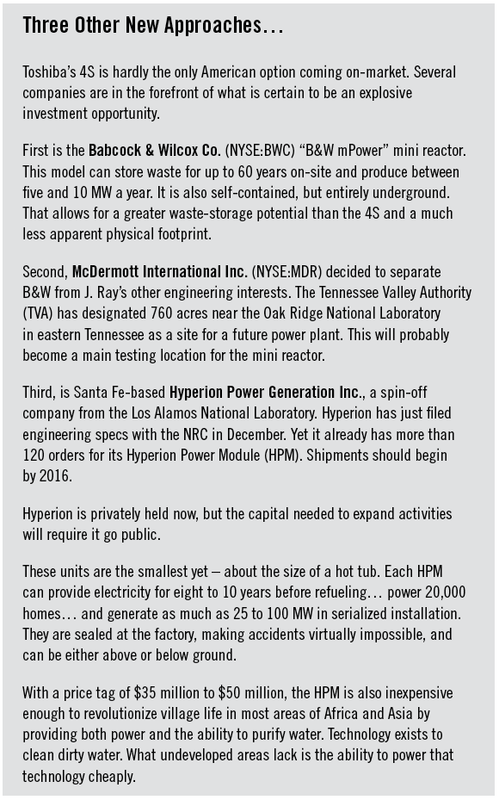 That adds up to 7,057 MW of potential capacity (up 26%, year-on-year). Federal stimulus programs and tax incentives, coupled with strong state renewable energy standards, are fueling the growth. Washington has already committed some $600 million for 135 geothermal research projects in 25 states through 2012. A report from MIT found that there is enough energy in hard rock at an average of seven miles beneath the surface to meet the world's power needs for 30,000 years. This is not merely using the readily available sources from hot springs and geysers. The real source is the vast amounts of energy contained in dry rock – all over the world. The volcanic activity clogging Europe is certain to provide the latest enticement in what is becoming one of the great technological races in renewable energy. Winning the quest for this "holy grail" could well revolutionize the global energy system. EGS and HDR have been known for some time, but the ability to release the stored energy has been daunting and expensive. Yet several conclusions, including those made by the MIT report, contend that with investment amounting to little more than the cost of one or two new coal-fired power plants (one or two billion dollars), we could have significant power from the Earth's crust online and on tap in a couple of decades. Profiting From "The Breath of the Earth"
In April of last year, Japanese heavyweight Mitsubishi Heavy Industries Ltd. (TYO:7011) teamed up with Icelandic utility provider Reykjavik Energy to build geothermal projects jointly in developing countries throughout the world. The goal is staggering: to control no less than 50% of the global market in four years. For exploitation of clean energy, more than 90 geothermal power plants have been constructed in Japan, as well as in 11 overseas countries. The potential of geothermal resources is estimated at around 20,000 MW capacity. Yet so far only 536 MW of geothermal power generation capacity are installed and operating in Japan and no concrete numbers of planned projects are available. To be a major player requires EGS approaches. And that introduces a concern: EGS takes considerable hydraulic stimulation – which, upon occasion, causes seismic activity. To date, EGS projects have produced no fewer than five earthquakes in various parts of the world, measuring up to 3.9 on the Richter scale. Clearly, some care is needed in overseeing how the technology is applied. I'm tracking these geothermal companies in real time. As soon as they start making their moves, I'll let you know. Just make sure you're following along at oilandenergyinvestor.com and, of course, the Energy Advantage newsletter. So let me introduce you to the companies currently on my list at these forefront in rolling out the technical applications. First up is Nevada Geothermal Power Inc. (TSX.V:NGP; OTC:NGLPF). This Vancouver-based company has been operating the Blue Mountain site in Nevada, currently producing nearly 50 MW of power, and is phasing in activities at three locations in Nevada and one in Oregon. Once all these locations are operational, the company expects an added aggregate power generation of between 150 and 300 MW. And it just bought three projects in southern California's Imperial Valley, one of the world's premier geothermal areas. I am also watching a private company with dual headquarters in Bend, Oregon, and Reno, Nevada – Gradient Resources (formerly Vulcan Power). This outfit actually lays claim to the largest geothermal property portfolio in the country, controlling over 170,000 acres of natural steam land with a more than 1,200 MW total geothermal generation potential for utilities throughout the western U.S. In March, Gradient filed for permission to build a 60 MW binarycycle geothermal power plant near Fernley, Nevada. That facility is within 30 miles of five existing geothermal plants. Gradient expects the plant to be in operation by 2012. The rising price of oil has obliged companies across the board to rev up drilling. But none of the operators drills its own wells any more; nor do these operators shoot their own seismic, survey their own geologicals, analyze their own well logs, or provide much of their own field technical support. With the increase in horizontal drilling and hydrofracking – certain to become a greater slice of the OFS market in North America – and the continued expansion of shale gas drilling, greater horsepower is required in equipment at the wellhead. All of this work comes from the sector known as Oil Field Services (OFS). Well before the surge takes place in crude actually coming online, OFS companies will be neck-deep in new contracts. Hefty profits are made there before even a drop of oil comes out of the ground. My favorite OFS provider is Schlumberger Ltd. (NYSE:SLB). Based in Houston, Schlumberger is a large, multi-functional, internationally diversified service provider. It boasts a double-digit profit margin and a double-digit return on equity. So this is a fabulous opportunity to buy a highly profitable company in an industry with stellar growth prospects. Schlumberger has been part of the Portfolio since July 2010, and we've made 63% on it so far. Last August, SLB acquired Smith International Inc. in an $11 billion, all-stock deal. Now, as acquisitions go, this one is a vertical move. The two companies already worked together, so integration will be easy. That makes for bigger projects, stronger returns… and higher stock prices. There are two primary ways SLB is already benefiting. First, it's taking greater control in a quite concentrated market sector. Smith is a diversified OFS provider, best known as a highly successful market leader in drill bits, drilling fluids, and technology. Its three operating divisions are: OFS provisions, pipe and tool/equipment provider Wilson, and the M-I SWACO joint venture in the U.S. and more than 75 other countries around the world. M-I SWACO has likewise provided some significant value-added enhancements to Schlumberger's line of field offerings. The new, enlarged SLB will be more competitive – and that spells advantage to its shareholders, and trouble for its competitors. There will still be work for others – the sector is simply too large for one company to monopolize – but SLB will have greater leverage to select projects with the highest returns. Second, Schlumberger will be positioned to dominate in providing services in five separate areas: integrated fluids engineering (IFE), wellbore productivity, production technologies, environmental impact solutions, and the development of new equipment and approaches. This is what I mean by "a vertical move." Both the OFS provided, and the support provisions required to make it happen, are coming under one corporate structure. In particular, for the past several years, I have been watching the development and application of IFE. And I think it is likely to become one of the most significant changes in how drilling companies actually do business. IFE is resulting in substantial savings in the field, as both drilling fluids and fluid wastes are more effectively delivered and managed. It already improves the efficiency of wells at a lower overall cost of operations. OFS is becoming especially important for major producing countries abroad, as more of the actual aggregate production moves away from North America. OPEC will require OFS help, as will the largest non- OPEC (and currently the world's largest) source – Russia. Moscow is in a most pressing situation. It needs to offset a declining traditional production base with new fields in more expensive areas requires technology that must be imported. Primary domestic Russian OFS providers that just happen to trade on Western stock markets will yield considerable upside potential, as will international OFS providers with a track record in Russia. Eurasia Drilling (LSE:EDCL) and the Integra Group (LSE:INTE) are the leaders in the first category, while Halliburton (NYSE:HAL), Baker Hughes (NYSE:BHI), and Schlumberger lead the list of Western OFS providers with a track record in Russia. Last October, Schlumberger and Eurasia announced the signing of a letter of intent (LOI) to buy and sell one another's drilling and service assets. Of even greater significance is their agreement to join forces throughout the Commonwealth of Independent States (CIS), the loose association comprising 11 of the former Soviet states. According to the letter, the two companies will enter into a strategic alliance there. Schlumberger will sell to Eurasia all of its drilling, sidetracking (directional drilling around an obstacle or following a well collapse), and workover rigs currently in operation in western Siberia, and those rigs' crews will move over to Eurasia, as well. But the initial move finds Schlumberger actually purchasing the Eurasia drilling services businesses, including directional drilling, measurement, cementing, and fluids services supporting 80 rigs currently in operation. And those crews move to Schlumberger. The rather complicated cross-sale and purchase is required… because of Russian law. A foreign company like Schlumberger owning one of the top three drilling combines in the country would raise a number of political red flags. So the agreed-to structure allows Schlumberger to operate through already existing Eurasia arrangements in Russia and other CIS countries. Eurasia will remain the party of record in providing the services, but Schlumberger will provide more and more of the management, technical know-how, and specialized equipment. Here's the primary end result of the strategic alliance contemplated by the letter: Schlumberger will become the preferred supplier of highend drilling services to Eurasia, encompassing the work of up to 200 rigs for a five-year period. This is not a merger. What it is, however, may be far more important than that. Schlumberger has been in the Russian market and region for some time. It remains one of the largest foreign OFS providers in the country. But over the past two years, it has experienced rising competition from Chinese drillers – especially in the central Asian CIS republics of Kazakhstan, Turkmenistan, and Uzbekistan – while the Russian government has assumed a more defensive stance over who has control in the domestic OFS market. This agreement with Eurasia is an effective way for Schlumberger to counter both the Chinese and Russian moves. The recent nationalistic pullback in new Russian legislation has increased the vulnerability of foreign players, especially in any service provision connected to the extraction of raw materials. By entering into an alliance, rather than pursuing a strict M&A play, Schlumberger avoids attracting the jaundiced eye of the Kremlin. It also substantially increases business in what is certainly a major area for OFS expansion. Western Siberian fields – the mainstay for traditional Russian production – may be rapidly maturing, with an attendant official Russian concern about overall declines in extraction levels. However, development in eastern Siberia is only beginning. There, Moscow needs to provide accelerating extractions, both to reverse the aggregate decline and to fill the major East Siberia-Pacific Ocean (ESPO) pipeline currently under construction. ESPO volume will move to China on a spur line and to the broader Asian-Pacific region via the new oil terminal and processing complex at port city Kozmino on Russia's Pacific coast. It is in eastern Siberia that this alliance will initially pay some handsome dividends for SLB. Both companies also regard the move as improving prospects for major contracts in Kazakhstan – where significant new crude oil totals will be coming on-line during the next several years. That will transform the country into the single most important rising source of oil in the world. If Schlumberger moved on its own, into either the Siberian or Kazakh market, that would create significant problems with regulators. On the other hand, Eurasia has been stymied in its attempts to attract major new contracts in Kazakhstan and elsewhere in the central Asian region, because of concerns over the sophistication of its equipment and technology. Schlumberger removes that problem. Kazakhstan and Russia are also in a new Customs Union, making cross-border contracts easier. With the focus moving again to Russia, now displacing Saudi Arabia as the global leader in oil production, the alliance will put Schlumberger in a privileged service position moving forward. And we're sure to reap the benefits. Action to Take: Buy Schlumberger Ltd. (NYSE:SLB) at market and use a 30% trailing stop to protect your principal and your profits.